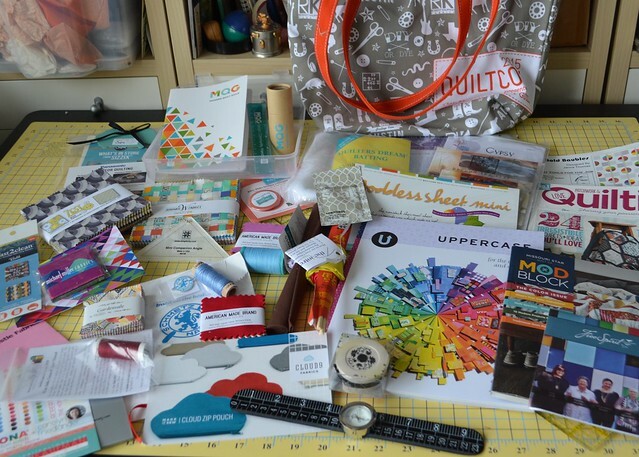 When I checked into QuiltCon 2015, I was greeted by friendly Modern Quilt Guild volunteers and I was handed that bag which was filled with all this lovely stuff. 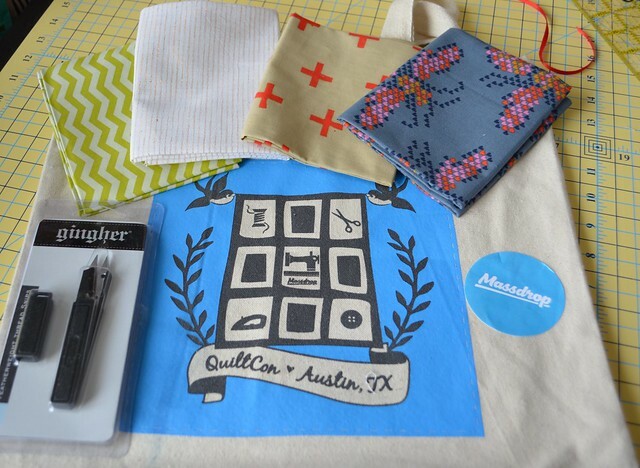 Thank you to the QuiltCon sponsors, who were very generous with their swag. 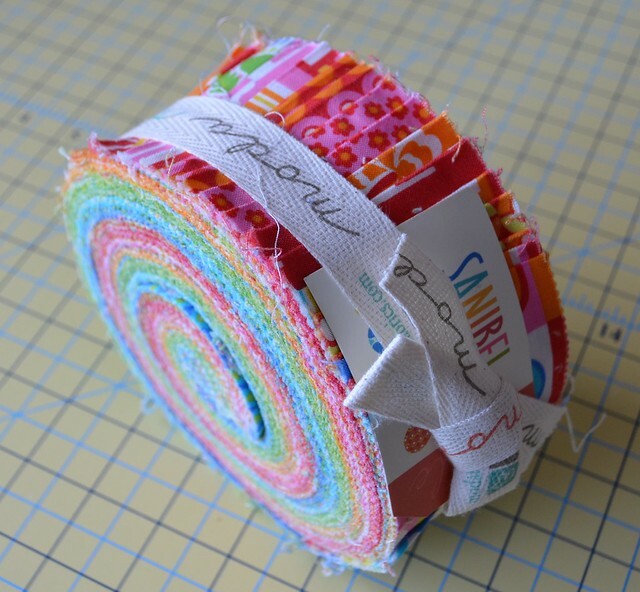 I also won this lovely jelly roll at the Moda Party on Thursday night. I think I might bring it to my local MQG meeting and offer it as a door prize, to share a bit of the QuiltCon love forward. I stopped by to meet the folks at the Massdrop booth, and they gave me this lovely bag and goodies. The snips are especially useful. I participated in the #quiltconpinswap. 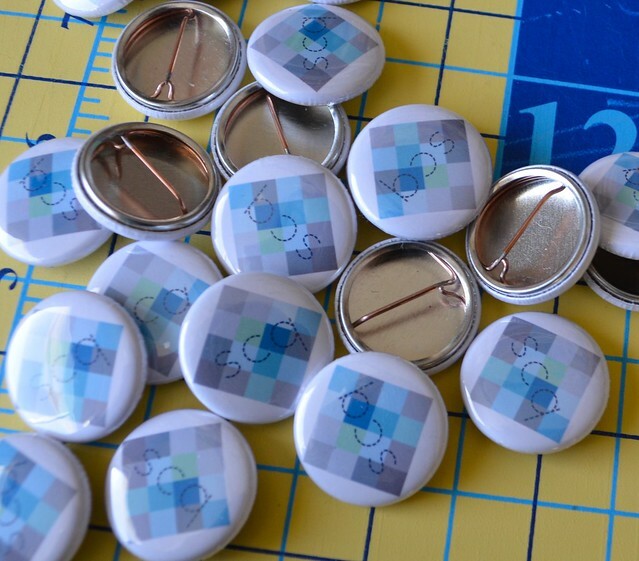 With the help of my friend Elizabeth from OP Quilts, I was able to order buttons at the last minute. I am so glad I joined in, as swapping pins was a great way to meet people who might not have noticed me. It also gave me a tiny token to hand to folks I met. 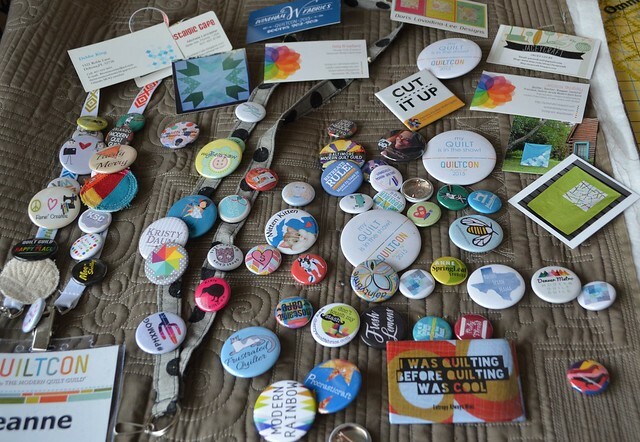 There are likely more buttons, I keep finding more tucked here and there, they were getting to heavy to pin onto me. And my kittens made off with the lovely handcrafted flower Hillary gave me, I am hoping it will turn up again soon. Seeing people I have met before but who live a long way away from me, meeting people I only know via the internet, and meeting entirely new people was the best part of QuiltCon 2015. These quilters are "my people" - our love of modern quilting, and just quilting generally generally makes us quick friends. You have noticed by now that I did not take a bunch of photos of me with people, I am just too camera adverse for that - you can catch glimpses of me all over the internet in photos that others took. 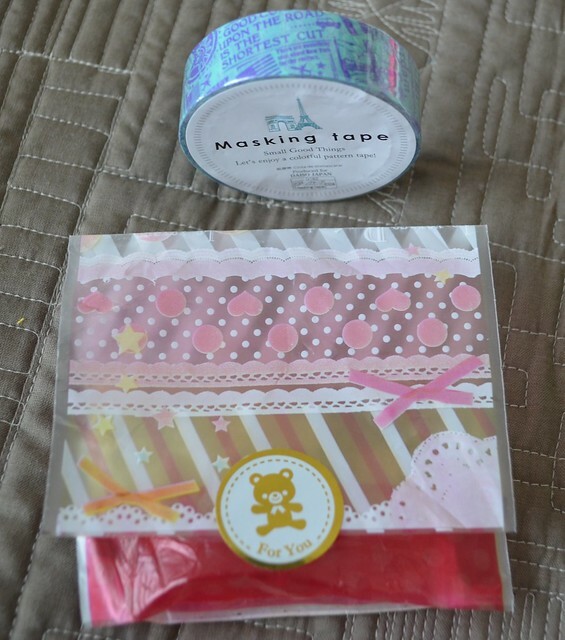 Elizabeth, from OP Quilts, tucked that cute bag filled with lovely Washi Tape in my bag - a thoughtful and lovely present. On Thursday morning, my friend Debbie from A Quilter's Table, stopped by at breakfast to give me this fantastic notebook. 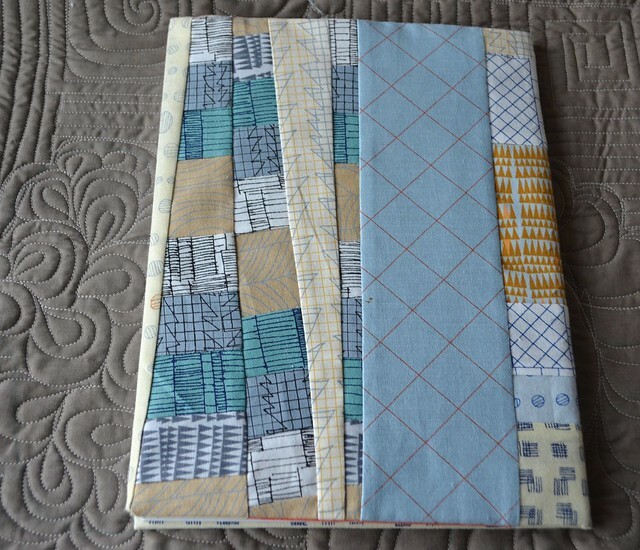 She put my Canvas pattern on the front and used one of my most favourite fabrics, Doe. Debbie knew I wanted a notebook for my classes but was just too pressed for time to actually make one - what a good friend. 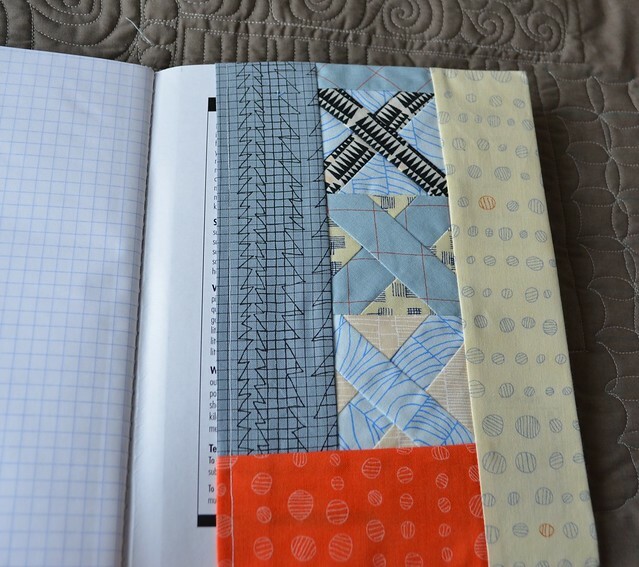 She added improv, including improv Xs, and a notebook of squares not lines, perfect for quilting notes. This gift was just so lovely to receive, as was finally getting to meet Debbie in person as she has become such a close internet friend. Krista, from Poppyprint, invited me to a small dinner on Friday night, with other good friends, some I had met in person before. It was such a good idea to have plans with small groups, where there is actually time to chat with everyone, and I will do more of that next time. 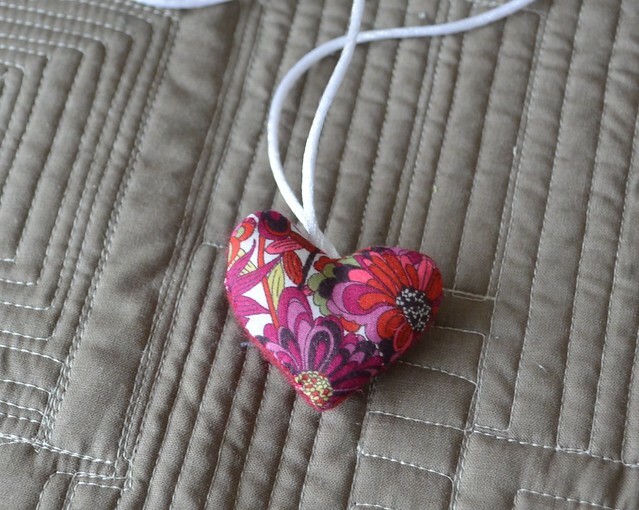 Krista gave us each a tiny Liberty heart. Cindy, from Live a Colorful Life, gave me chocolates, and they were gone quickly. I was remiss in not sharing this photo earlier, I had forgotten that I took the photo. That is the beautiful MQG Charity quilt that the members of my guild - including me - the Edmonton Modern Quilt Guild, had hanging at QuiltCon. It looked fantastic with the other quilts and you can read more about this quilt, designed by Stacey, from SLO Studio, here. Overall, QuiltCon 2015 was a wonderful experience for me. It is a quilting event where I see "my people" doing my kind of work. I was inspired pretty much every minute, and enjoyed everyone I met. A huge thank you to the folks at the Modern Quilt Guild for all the hard work and the planning! I am already planning to attend QuiltCon 2016, I hope you are too. I have one more QuiltCon post to tell you about the QuiltCon magazine and the quilt and pattern I have in it, it has been hard keeping it a secret for so long. That looks like real fantastic days! 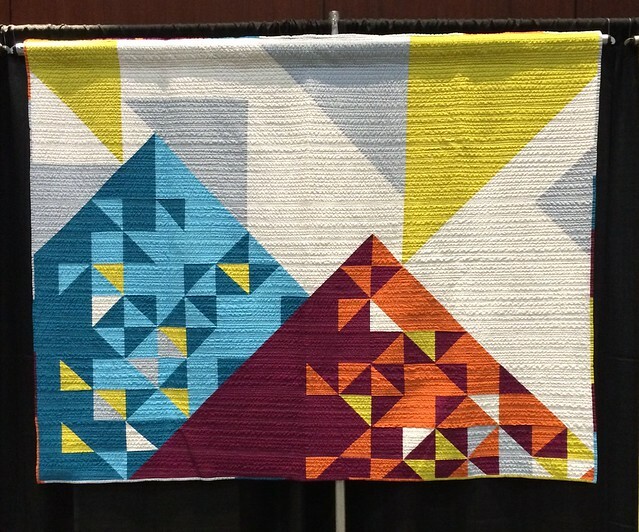 What a full post about some of the wonders of QuiltCon. 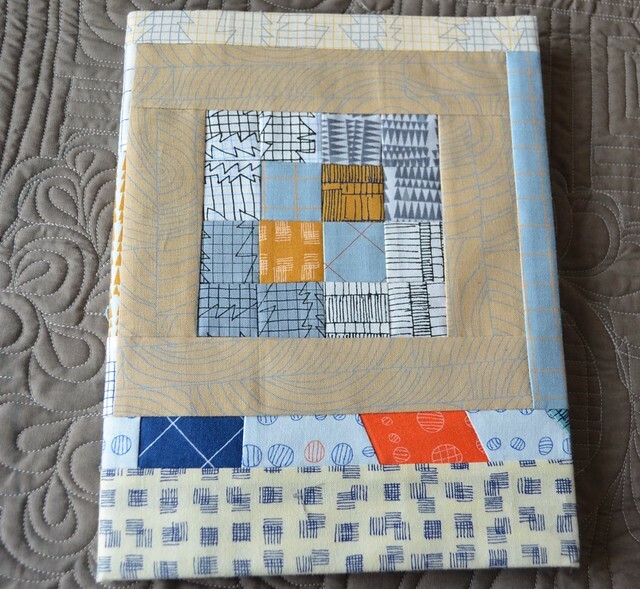 ;-) Glad you like the notebook and I'm glad you showed off your guild quilt - very nice!! That quilt is pretty awesome. I'm so glad we got to meet and chat! and I'm so glad that you are sharing this wonderful experience! So what do you have to do to get the bag of goodies? Take lots of classes or what? (Moda), and from Massdrop 4 fat quarters--sadly no gingher snips. I did, however, see many people going back over and over again to get multiples and I thought that was greedy and unfair to the sponsors. I love reading all the QuiltCon posts after being there in person this time . . . especially from people like you that I got to meet in person. Next time we need to spend more time together. It was a lovely experience, wasn't it? Your guild's charity quilt is beautiful, very striking! Sounds like you enjoyed yourself. Good for you! You'd need an empty suitcase for all of that swag! What super sponsors. How thoughtful was your notebook? Quilters are good people. looks like a great trip and some lovely gifts.A fun time. Thanks for sharing Leanne! (and for taking a photo of our quilt "in situ." :) ) I wish I could have been there, and hoping to go next year!